Before moving to Melbourne, I’d heard so much about its’ vintage clothing scene, yet when I arrived I was completely let down. I searched endlessly for these shops. I’d run in and out of cafés asking for directions yet always being told “walk towards an arcade”. This “arcade” concept was completely foreign to me and I’d leave even more confused, still searching for something resembling an American arcade with games and flashing lights. No wonder I never found anything. It wasn’t until I attended a spring fashion week event last year entitled “Mending, Meandering and Merlot” that I finally figured it out . The day consisted of a walking tour of Melbourne’s underground vintage scene, and concluded with a sewing class and wine tasting. There couldn’t have been a more perfect day. So here’s my list, made up of stores discovered that day, and others I think are definitely worth visiting. 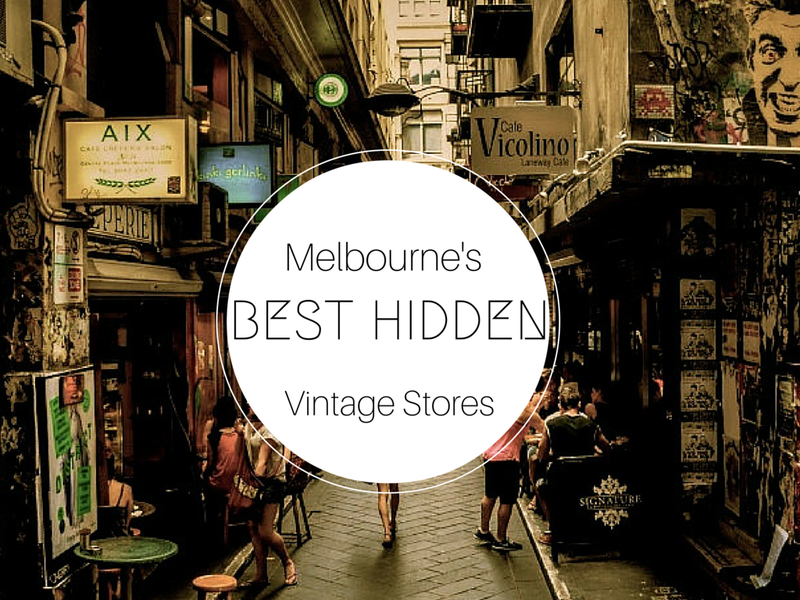 Whether you’ve just moved to Melbourne, are thinking of visiting, or simply curious to the whereabouts of these stores, this list is for you. This underground walkway might seem a bit creepy at first. It doesn’t seem to matter what time of day I’ve been down there, its’ always an erie type of calm. Made stranger by thinking the street directly above, is one of Melbourne busiest. Lining the walkway are glass cabinets housing the works of local artists (the “Dirty Dozen”). There are also are handful of cool shops down there including Corky St.Clair (jeweller) and the Sticky Institute, where you can play all day making your very own mini magazine, or as they call them “zines”. The blue and white stripped jacket worn in this post is from here. The shop is literally the size of a closet, so it doesn’t take long to rummage through and therefore always worth a stop. The last time I walked by, there were a pair of old fashioned figure skates in the window, so you never quite know what you’ll find. You’re typical Salvation Army feel, but made just a bit cooler being the basement of the Royal Arcade. This is vintage at its’ finest. These are quality garments for the special occasion. Just getting to the shop is like going through a time machine. Located in one of the city’s most beautiful art deco buildings, you take an old fashioned lift up to level one. Once there, many little signs will guide you to the right door. Enjoy! This was the first store I successfully found on my own. If you’re not looking for this place you’ll miss it. When walking down Flinders Street keep your eyes peeled for a stair case lined with funky clothing. You’ll probably hear the sounds of 70’s rock enticing you downwards to the dimly lit shop chalk full of men’s and women’s vintage. This is a modern vintage store, by that meaning it’s curated superbly with current trends. Perfect for the fashion lover who wants a one of a kind piece. A little easier to find than most on the list, it’s just a few steps up from street level off Flinders Lane. Look for the neon lights! The fist time I asked for directions to an op shop, I’m sure this is where they were directing me. It’s says level one, but you’ve got to walk up a few flights to get there. One of the biggest vintage stores in Melbourne, it reminds me of the stores that line Height St. in San Francisco. You could spend the whole day here. Definitely worth the hike up the stairs. Hi, I'm Molly! I write about things. Mostly what I've been sipping and what I've been thinking. Welcome!